1997 – In the Company a Quality Assurance System was implemented. 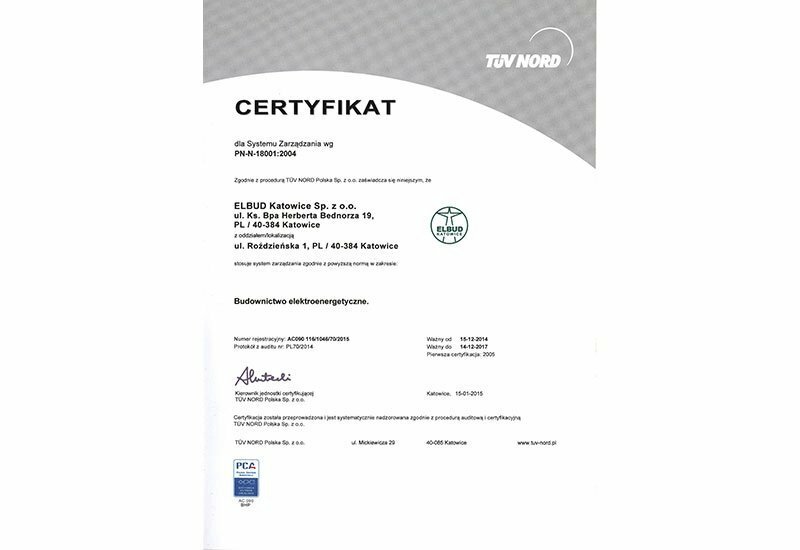 We were the first company in the electrical power construction branch with implemented ISO 9001 Quality Assurance System. 9001. 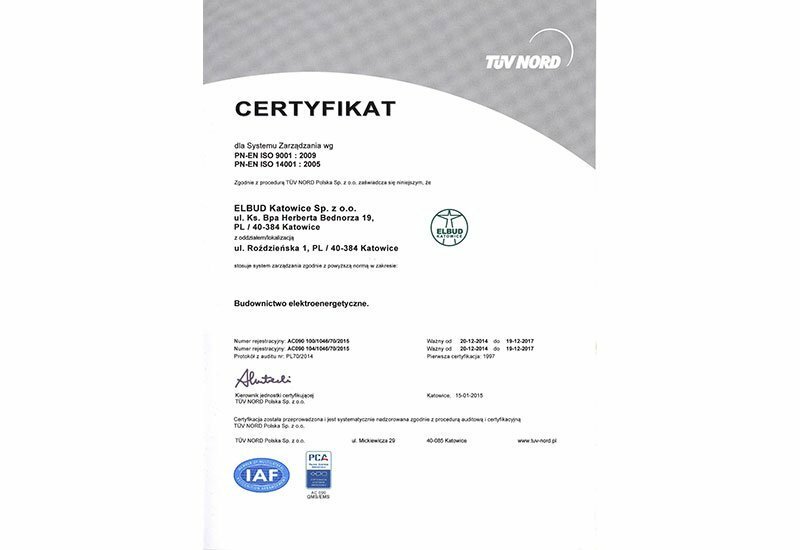 1999 – Introduction of the Integrated Quality Assurance and Environmental Management System, compliant with the PN-ISO 9001:1996 and EN-ISO 14001:1996 standards. 2003 – The Company upgrades to the Integrated Quality and Environment Management System, compliant with the PN-ISO 9001:2000 and EN-ISO 14001:1996 standards. 2005 – The Company implements the Integrated Quality, Environmental and Occupational Health & Safety System based on PN-EN ISO 9001:2000, PN EN ISO 14001:2005 and PN N 18001:2004 standards. 2009 – In the Company begins to function the Integrated Quality, Environmental and Occupational Health & Safety System based on the PN EN ISO 9001:2009, PN EN ISO 14001:2005 and PN N 18001:2004. This system has been operative until now. 2017 – The Integrated Management System based on PN EN ISO 9001:2015, PN EN ISO 14001:2015 and 18001:2004 standards begins to function in the Company. Steady fulfilment of requirements, and anticipation of future needs and expectations is a challenge for the Company in more and more dynamic and complex environment. It can be achieved by optimal application of PDCA cycle and risk-based approach, what has been taken into consideration in the ISO 9001:2015 and ISO 14001:2015 standard versions, implemented by the Company in November 2017. The Integrated Quality, Environmental and Occupational Health & Safety System is in force in all organisational units of the Company. Correct understanding and strict adherence to the requirements of the standards and documents of management system clearly improve the quality of the services provided, and enhance our Customers’ satisfaction out of the effects of our activities, and meeting of important requirements of the involved parties is ensured. Our approach to the execution of duties protects the natural environment and ensures safe work conditions.